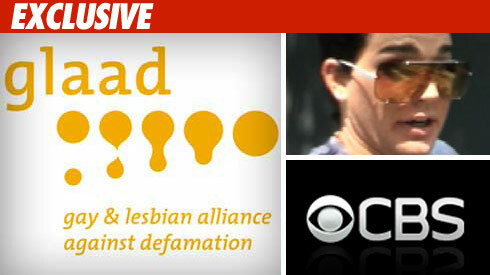 GLAAD to CBS: Treat Us Like Equals! CBS' explanation for why they blurred Adam Lambert's man-on-man kiss ain't cuttin' it with the folks at GLAAD -- who claim the network is treating openly gay performers as second class citizens. Jarrett Barrios, president of GLAAD -- the Gay & Lesbian Alliance Against Defamation -- tells TMZ, "The Early Show's decision this morning to blur Adam Lambert's kiss from the American Music Awards reinforces an unfortunate double standard that is applied to openly gay performers." Barrios adds, "I would have hoped CBS would provide the same treatment for images of gay and lesbian people and not create an unfair double standard that treats our community differently."